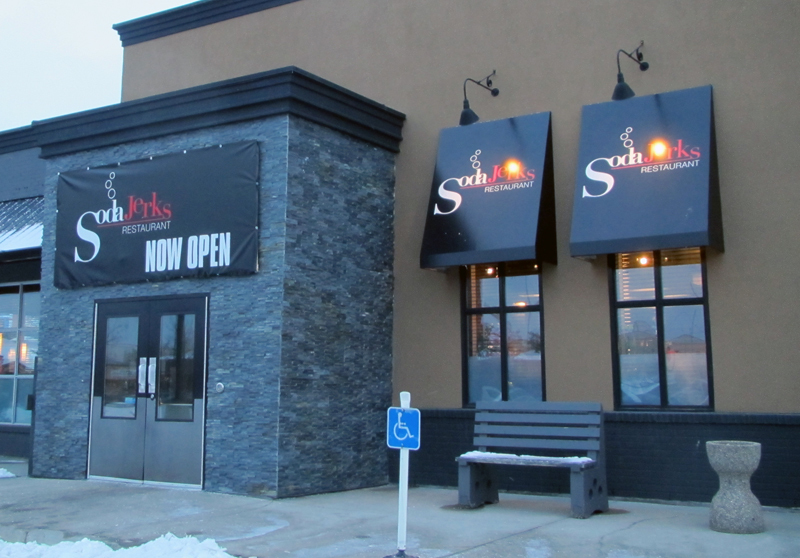 Soda Jerks opened up in west Edmonton a few weeks back. This location has seen a few restaurants come and go over the years, but based on my experiences thus far, I hope Soda Jerks sticks around. It's an unpretentious, fun little restaurant that serves excellent burgers and fries with a smile on the side. Real soda jerks vanished long ago and are remembered today only by those who grew up in the 50s or who have absorbed popular culture depicting the era. For the uninitiated, the soda jerk was the person responsible for the soda fountain, mixing pops and floats. There is no soda jerk at Soda Jerks, but they do offer a multitude of soda pop flavours, from the common to the obscure. I indulged in a Stewart's Black Cherry cola while I waited for my meal, a sandwich from the Build Your Own menu. I selected grilled chicken on sourdough bread with chipotle aioli, cheddar, tomatoes, iceberg lettuce, caramelized onions, bacon and guacamole, with a side of fries. Service at Soda Jerks seems a little on the slow side, but the ambiance and the friendly servers help the time pass painlessly. And when the food arrives, the wait makes it all worth it. My sandwich was succulent, with fresh ingredients that burst across my palate. The fries were just the right temperature and texture, hand-cut with the skins on. Perfect. When I came back for another try with Sylvia, she ordered the chicken quesadilla and pronounced it "excellent." I didn't have the nerve to try their most intriguing appetizer, the deep fried pickle slices. Perhaps next time. Price and portion size are well balanced. If you crave a juicy hamburger or wish to indulge your creative side, drop in, try an old-fashioned soda and enjoy a pseudo-retro dining experience that will leave your stomach full and your wallet only slightly empty.